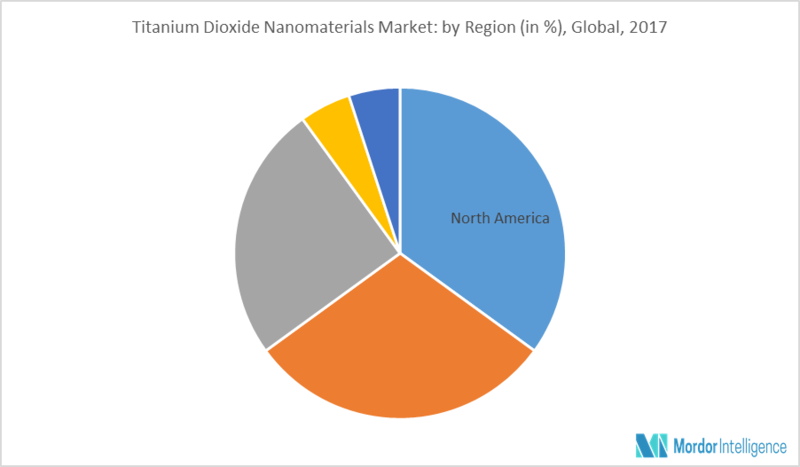 The titanium dioxide nanomaterials market is expected to grow at a CAGR of 8.1% during the forecast period (2018 - 2023). One of the major factors driving the market is the growing demand for personal care products. In addition, the growing demand for the end-user products from the Asia-Pacific economies, like India and ASEAN, is also expected to drive the market. Nanomaterials are majorly used in the cosmetics industry because they provide enhanced performance and produce aesthetically more pleasing results, such as smooth skin surface and glowing complexion, thereby, increasing the production of nanomaterial production process among the cosmetic manufacturers. Nanoparticles offer potential benefits in the ultrafine form for products, such as moisturizers, sunscreen, etc. Therefore, this intrinsic benefit has increased its usage in other personal products, such as deodorants, perfumes, moisturizers, anti-aging creams, toothpastes, soaps, lip balms & lipsticks, shampoos, etc. The market is segmented on the basis of type and application. On the basis of type, rutile dominates the market and is expected to show a good growth rate because of its increasing use in sun creams, paints & dyes, anatase modifications, and photocatalysis applications. On the basis of application, the personal care products dominate the market and are expected to grow at a moderate rate, primarily because of regulations on its toxic nature. North America is the dominant region, it covers a share of approximately 40% of the global market. North America is expected to show a moderate growth rate because of the government restriction on the usage of titanium dioxide nanoparticles. However, the growing applications in wastewater treatment for removing arsenic in the drinking water, combined with the increasing usage in cosmetics, is expected to drive the market. Europe is also expected to show a moderate growth rate because of titanium dioxide regulations in the paints & coatings sector. Major Players: ACS Material, Altair Nanomaterials, American Elements, Cristal, MkNano, Shanghai Xiaoxiang Chemicals Co., Sigma Aldrich, Tronox, US Research Nanomaterials, and Xuancheng Jinguri New Material, among others. 8.6 Shanghai Xiaoxiang Chemicals Co.